It’s still mud season in central Indiana, but the April garden is starting to bloom. 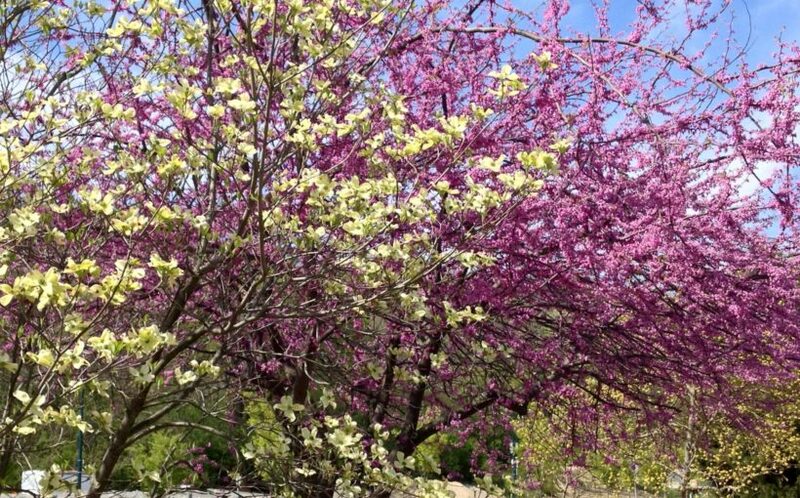 Check out blooming shrubs and trees, as well as daffodils and tulips. Perennials are shooting out of the ground. All that fresh, green foliage looks great after a winter of brown! Shrubs are starting to put out their leaves. Many flowering trees, including fruit trees, bloom in the April garden. Daffodils are blooming! It’s been a late spring, but the bulb show is finally underway. We should see tulips blooming by the end of the month. We’re still finishing up spring cleanup. To schedule yours, call us at (317) 356-8808. We side dress shrubs and perennials with compost as the buds swell to provide gentle, slow-release nutrients. We’re pruning summer-blooming shrubs now. Once the ground dries a bit more, we’ll start mowing lawns at a height of 3.0″ to 3.5″. In the vegetable garden, we’re still waiting for the ground to dry enough to plant our spring crops, including lettuce, radishes, carrots, and peas. We’ll also plant asparagus, rhubarb, strawberries, and bramble fruits. Don’t fertilize the lawn! Fertilizing in April promotes growth at the expense of root health.